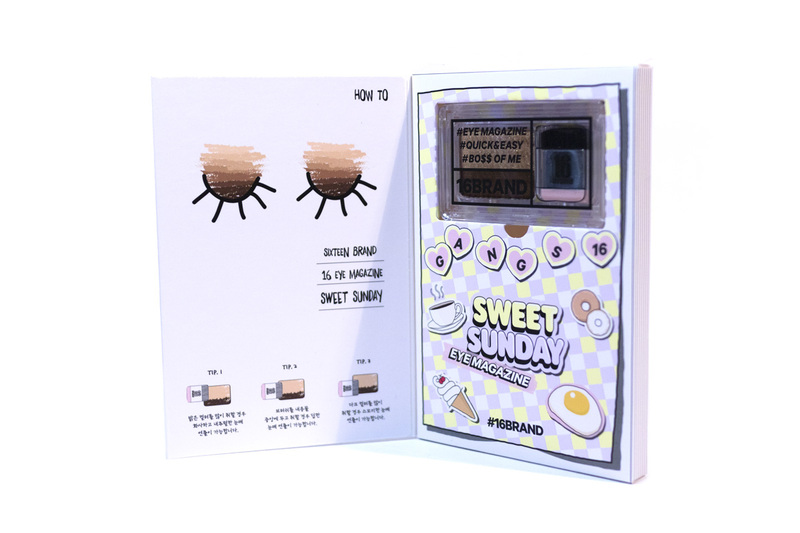 Review: Eye Magazine – Sweet Sunday (16 Brand) – Oh My Stellar! I’ve used one of these one swipe eyeshadows one other time in the past and, to be honest, the experience was rather terrible. 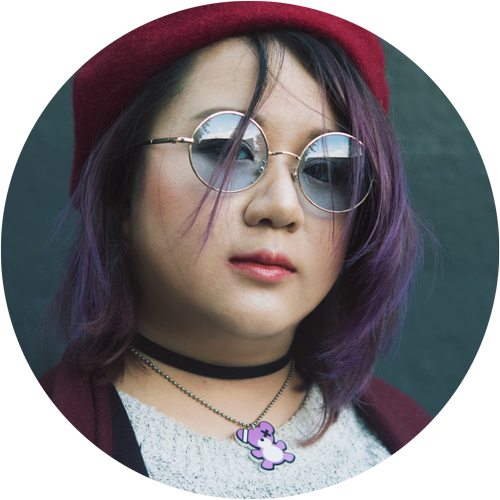 I have a strange eyeshadow where I have multiple eyelids – most Asian people either have monolids or double, but a few of us seem to have been blessed with a hundred and two. I’ve been told that this makes our eyes look rounded and larger but, really, all I’ve noticed is that it makes eye make up rather difficult. Because of these folds, which are also uneven on both eyes, I have difficulty doing winged eyeliner. Another problem I have tends to be with these one swipe shadows because the product applicator is designed for a flatter and more even surface. 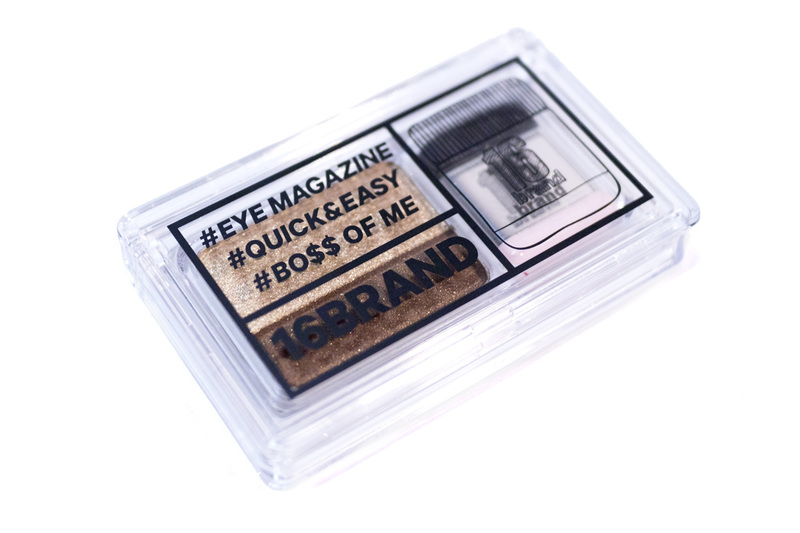 Still, when I came across these Sixteen Brand 16 Eye Magazine shadows, I wanted to try them out at least once. The packaging is really cute and, since it’s a powder form, I was also more confident that it wouldn’t blend out into nothing like the Laneige Two Tone Eye Bars. This also has a brush applicator and the ratio of the two colours can be customised to your own preferences. so I liked that these are more flexible. Even if I was unable to use them as intended, I knew that they would work as a standard shadow duo. So, StyleKorean sent me over one of these to try out. I chose the Sweet Sunday variation, which is a combination between a warm dark brown and gold shimmer. These Eye Magazine shadows come in four variations (Every Day, Hello Monday, Sweet Sunday and Hey My Day). 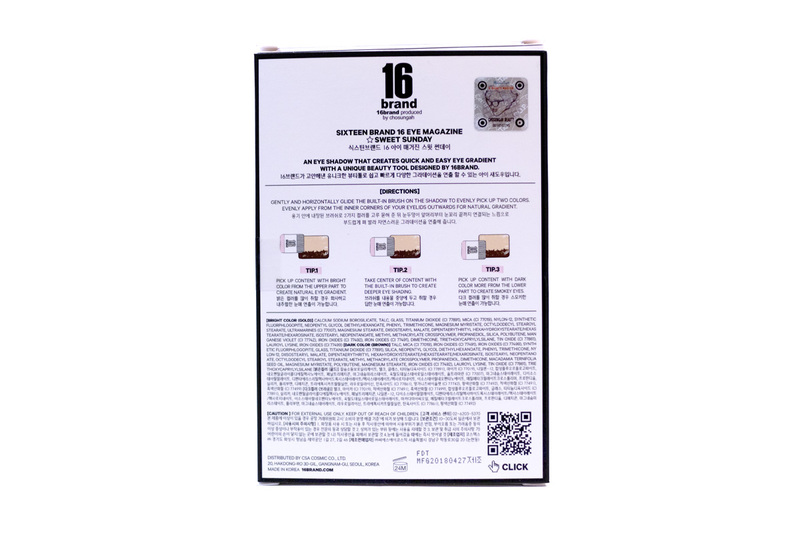 They usually sell for USD$19.23 but are currently on sale for USD$11.99. I have reviewed 16 Brand products multiple times in the past (which you can see in my tags), so I have a lot written about the brand already. 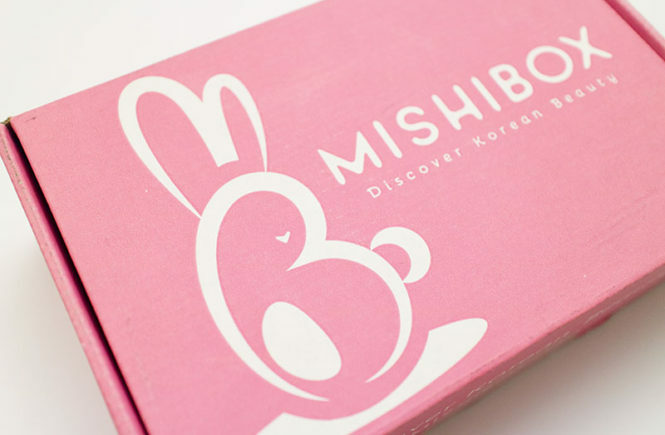 They are a relatively new brand that was started by a Korean celebrity make up artist, Cho Sung Ah. 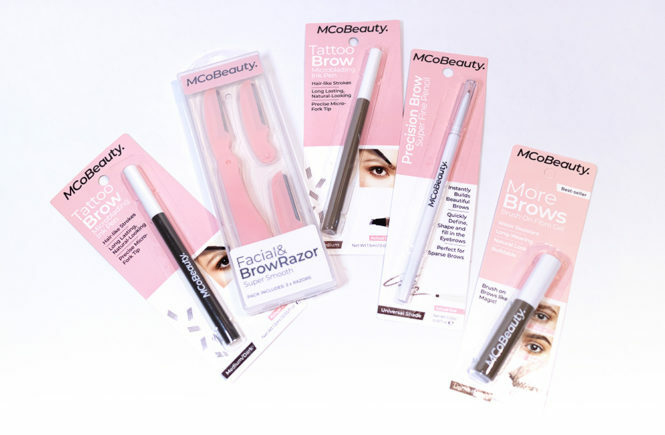 I first came across them through their fingerpens, which were one of the first products that they’d launched, and they have since expanded a lot. In the past, I feel like the brand does struggle with consistency. Some products tend to be better than others and their official swatches also have a tendency to look different to the actual product. I always love their packaging design and I also like the brand concept, which is more trendy and playful, so I do continue to support them and want to see their products develop. 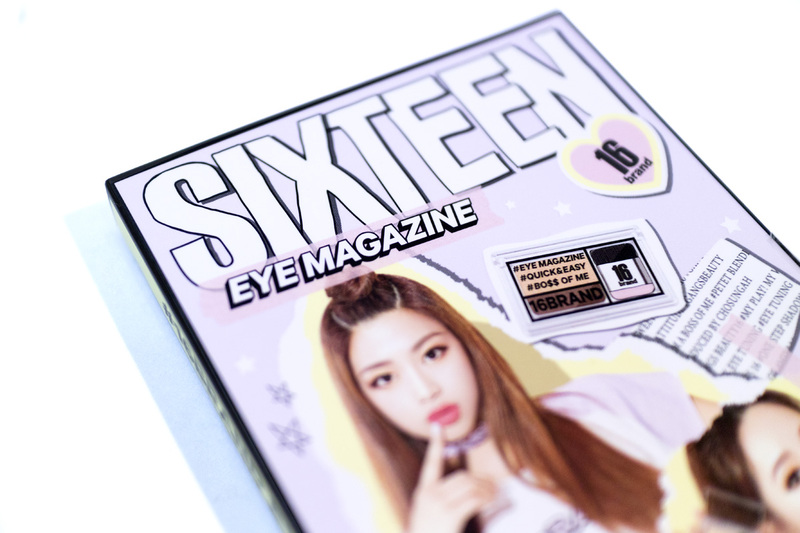 As for this product, this is their 16 Eye Magazine and their description (as taken from the StyleKorean page) states: “Mix & Match 2 colors in one step! Quick 3-second tuning makeup regardless of makeup skills,” as well as “Quick 3-second tuning shadow for modern people who are too busy to apply makeup before going to work or school.” It is targeted towards those who want a very quick and simple make up application and, I guess, aren’t too fussed about precision and experimentation. It is good for the contemporary lifestyle where people are always on the go but, for that reason, I’m maybe not their target audience. Although I live a fast and busy lifestyle, I still always take my time for my make up in the morning – it’s sort of therapeutic for me. 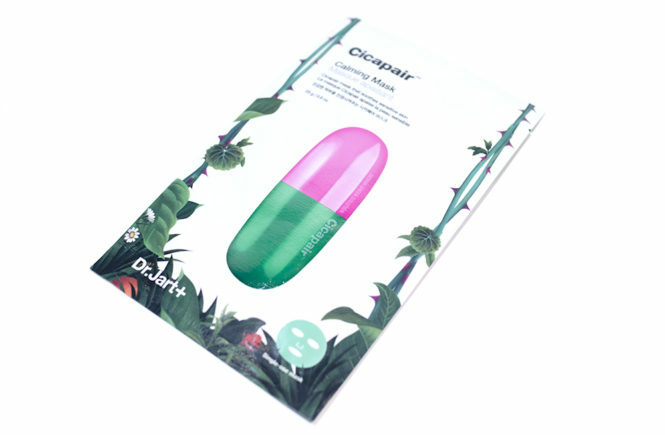 The packaging was the most exciting thing about this product. 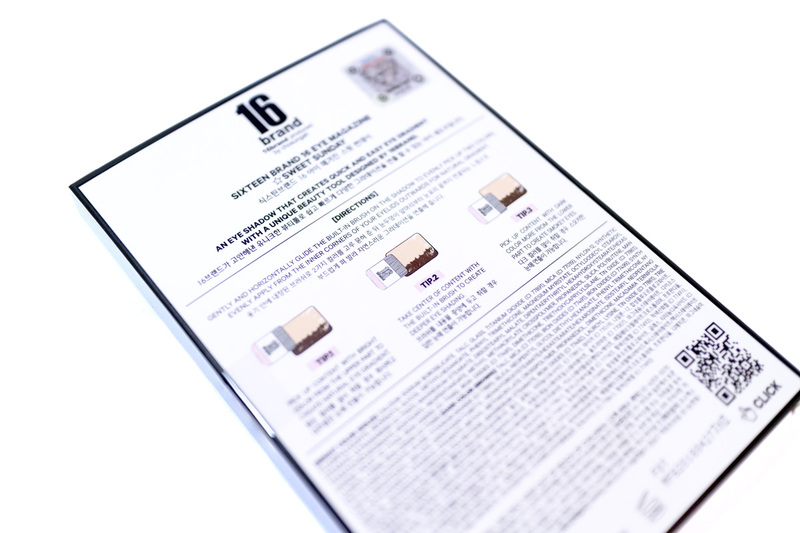 It ties into the 16 Eye Magazine concept of a ‘magazine’ where the product is housed in a paper box with a front that opens up, much like a magazine. The design of it, which is very cute and a bit kitschy like most other things from the brand, also mimics a fashion magazine design with the model’s photos and the large header. 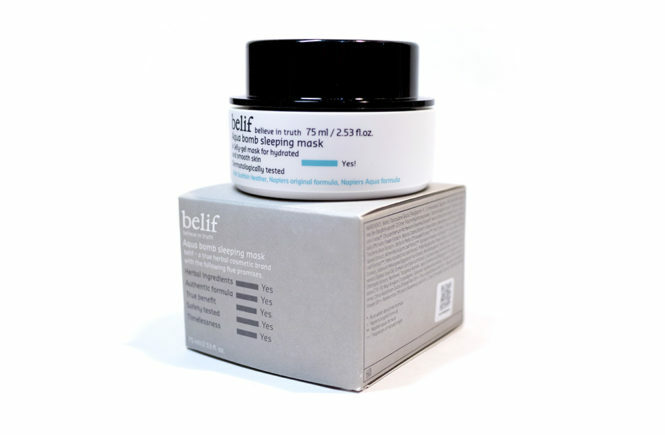 I think the packaging design is just so cute and it has a very youthful and fresh vibe. There are also small details, like the lines on the side and the illustrative instructions (see a few images above) on how the colour ratio can be customised, which add to the packaging concept. This is something that just looks so exciting regardless and I hope that they do this sort of thing for more products in the future. However, I do have to note that this is not an environmentally friendly choice. Although the packaging is made of paper, it is also cello glazed (which is where the paper is coated with plastic to make it smoother) meaning that it can no longer be recycled. In the future, using recyclable materials may be a better choice but, of course, it is up to you as a consumer to decide how you feel about that. When you open it up, you get the eyeshadow housed in a small plastic case. 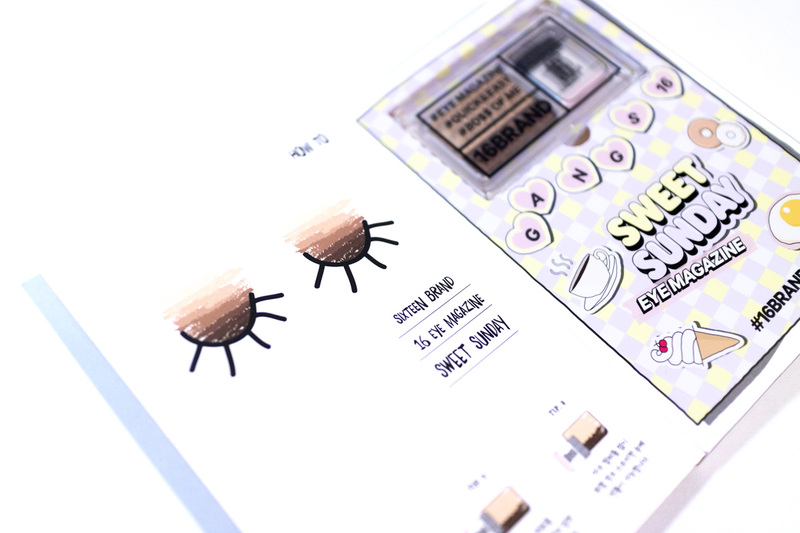 It’s light and very portable, so it’s easy to throw into your purse for anything for touch ups during the day. The case is made of a clear plastic, so you can see what’s inside. It also have a black, typographic print on the front of it which is quite cute and it gives it a stylised feel. The name of the shade is also listed on the back. Overall, the packaging feels quite nice and not cheap, even if it is plastic, as it’s quite sturdy. Opening it up, you get a pan with the two shades together. 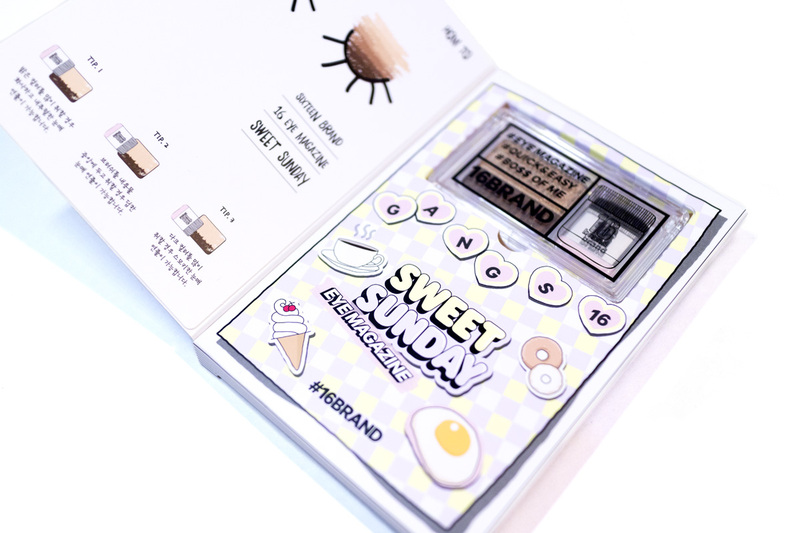 The two colours for Sweet Sunday are described as Glam Gold and Bronze Brown, which is quite accurate. 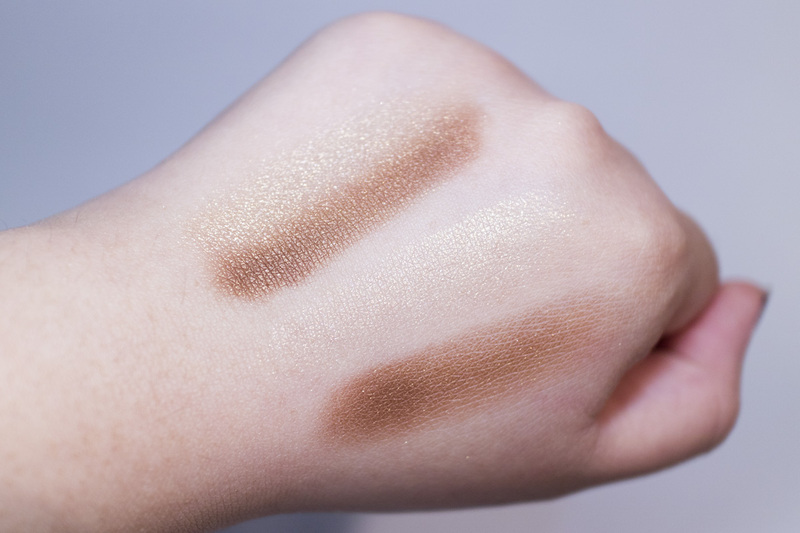 The shimmer shade looks a little bit warmer and closer to gold than my photo below, but it is also a lot more flattering than the official swatches photo – which comes across too yellow. The product also comes with a brush applicator, which I think is a great idea! I always like to use brushes for my eye make up, so the Laneige Two Toned Eye Bar was quite uncomfortable for me to use. That being said, this is also a rather interesting brush – it’s flat and wide, so it swipes across the entire eyelid easily. 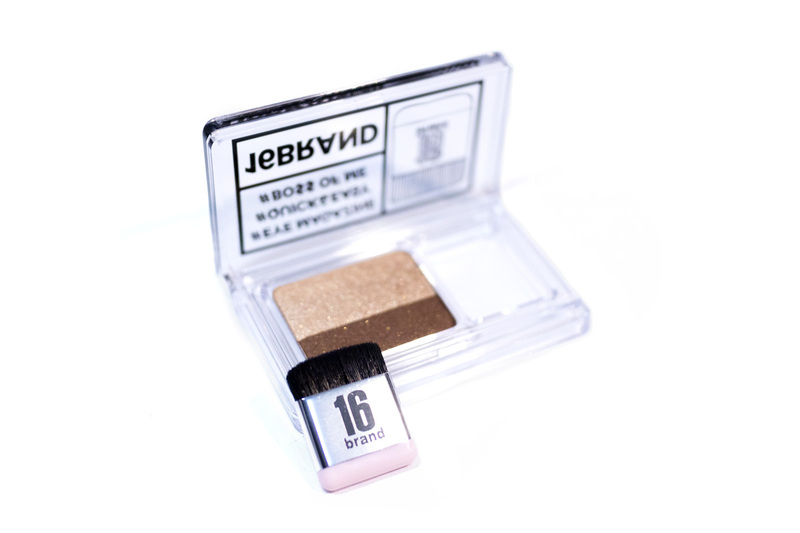 The bristles are also short and dense, so you can really pack on the pigment easily. I first tried to swatch this product without a primer, but the gold shimmer doesn’t show up at all! If you’re after a subtle look, then that would be okay. However, for myself, I would always use an eye primer when I’m applying this one. I like how you can customise the colour ratio, and I generally prefer to use less of the brown and more of the gold. – this is because I feel like having a dark shade all along my eyelid can make my eyes look too heavy. For the application of this, it is rather easy. It does have a bit of a learning curve though, so it took e a few tries because I could apply it quickly. I don’t think that it will ever be a quick one swipe application for me though, because I need to build the product is certain areas to suit my eye shape. 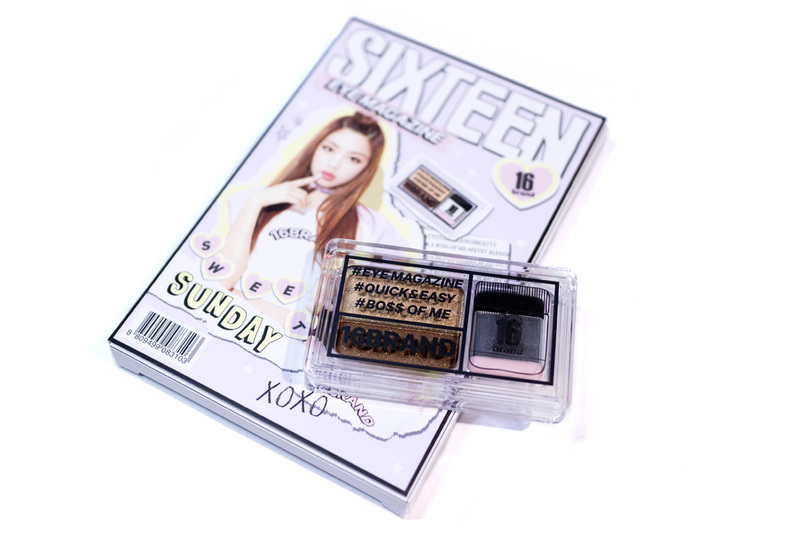 The colours do blend well together and, with a primer, the pigmentation is also pretty good for a Korean eyeshadow product. 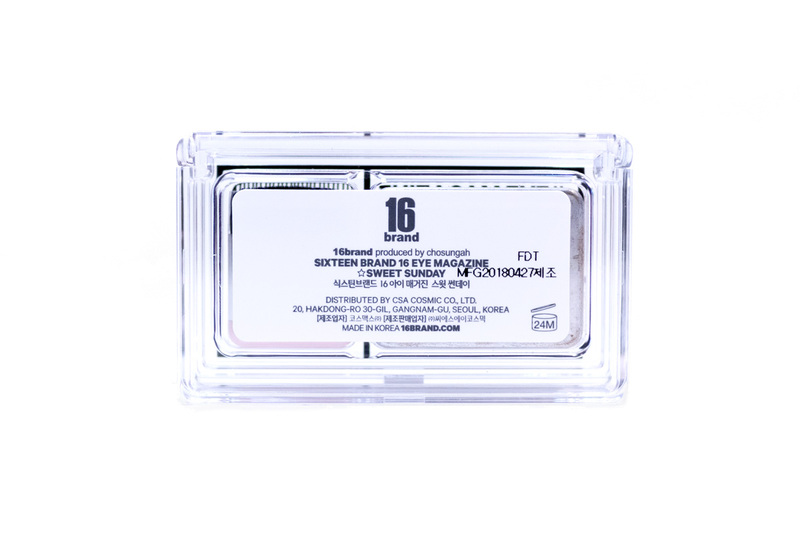 The longevity of this product is also good and I don’t have any issues with creasing or fading throughout the day, except for in my watery inner corners. 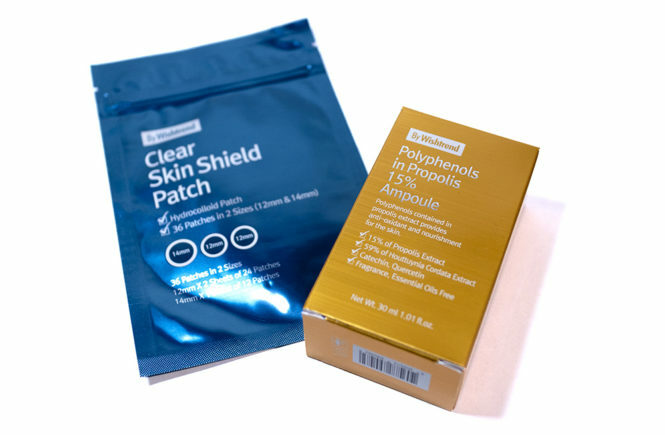 If you are wanting to touch up, then this is also an easy product to keep on hand. All of that being said, I can easily tell that this product was designed with Asian eyes in mind. I think that it would work a lot better on those with a flatter eyelid surface, monolids or smaller double eyelids. The width of the brush doesn’t suit my eyes that well, especially in the inner corners. For myself, I would generally start my application in the middle (where I would concentrate the colour) and then lighten it in the inner corners. I would also go in with a second application to deepen the outer corner and then a third for the lower eyelid. Rather than quick initial application, I actually like this product for touch ups during the day. You can either use your fingers to reapply certain areas or all over to sort of ‘blend out’ any shadow issues. I would recommend choosing a colour combination that works with your usual make up style. Alternatively, I sometimes also apply this all over my lid, and then use other eyeshadows to fix it to the style that I prefer. And so that’s my experience with this product. It’s definitely workable for me, but it’s not a one-swipe application and it takes me a bit of time to get it to work properly. When I do get it working well though, it’s really pretty! I like the colour combination and the shimmer is also super pretty! It does need an eye primer underneath it for the colour (especially the gold) to show up properly though – which isn’t a concern for me, since I always use a primer, but that’s also a personal thing. Overall, I’m on the fence about this product still. It’s definitely better than the other experiences that I’ve had, but it is still not fully living up to my expectations for it. 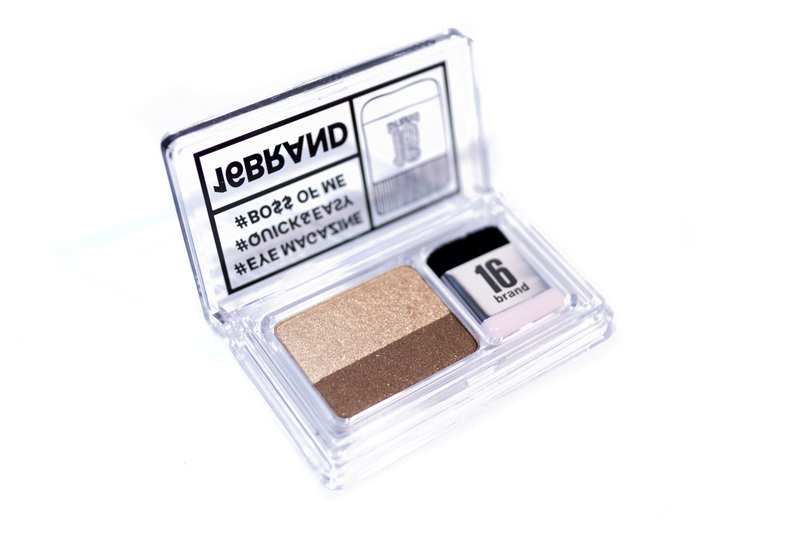 I’ll be continuing to use it but mostly as a touch up product or as a base and in conjunction with other eye shadows. It just doesn’t inspire any creativity, which is very important to me, and the brush doesn’t fully suit my eye shape. I will have to play around with it more (technique wise). And so, here’s my (wobbly) verdict! I think that this would better suit people with a different eye shape so I can’t completely write this off, especially since I can still see myself finding some use for it in my every day routine. However, I can’t recommend it based on my personal experiences – it just didn’t meet my expectations! I think that the eyeshadow formulas were good and, just like I tried out the other 16 Brand Eyeshadow Palette, I would recommend looking into those instead. 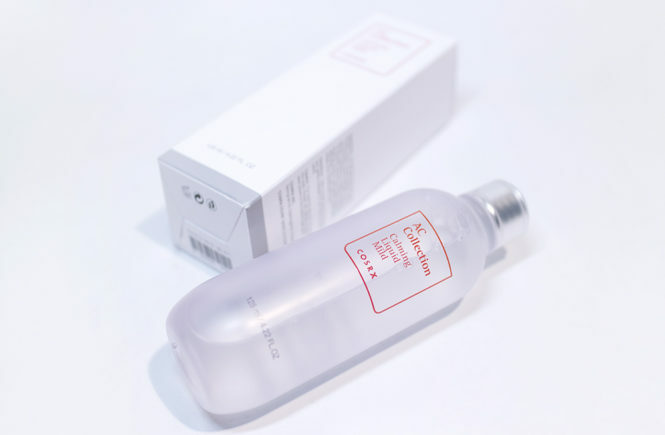 I got this product from StyleKorean, so you can also check it out on their website. It’s currently on sale for USD$11.99 – which is a great price – and they have all four colours in stock. You can see my one (Sweet Sunday), or Every Day, Hello Monday, or Hey My Day.